I must be getting better--my appetite is returning! 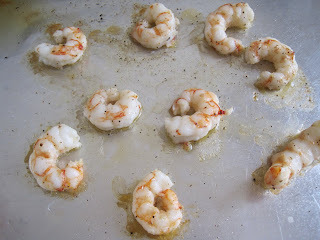 I figured this out quickly last night when I saw The Barefoot Contessa's Ina Garten make these shrimp. I had everything in my fridge & pantry to make this, and decided that by Thursday I'd be feeling well enough to eat something besides chicken soup and toast. Boy, am I glad I was right. Not to knock the regular boiled shrimp with standard cocktail sauce...there is room in my heart (and my stomach) for both. But this version kicks the other one's tails. 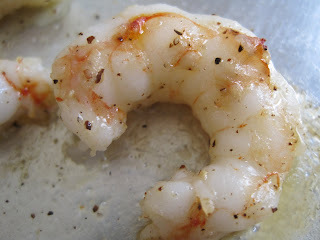 The shrimp I used are a recent favorite find from Trader Joe's: Red Argentinian Shrimp. They're wild shrimp caught of the coast of....yes, Argentina. They are described as having a lobster-like flavor, and I found that to be absolutely true. They are buttery and delicious and an affordable buy at 8 bucks a bag (I get at least 3-4 servings from one bag). Look for them in the frozen food section at TJ's! 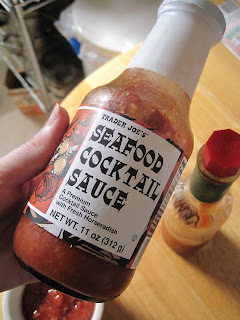 I bought some Trader Joe's cocktail sauce the last time ABF & I went there (a few weekends ago now). It's about 1.89 or something equally ridiculous, so I figured why not? My only complaint is that it's a little sweet for my tastes. I used some tips from Ina, adding Tabasco and some Worcestershire sauce to it, zinging it up in just the right way. Quick little rant here: the serving size is one TEASPOON. Who eats one TEASPOON of cocktail sauce. Seriously??? This recipe is SO. SIMPLE. 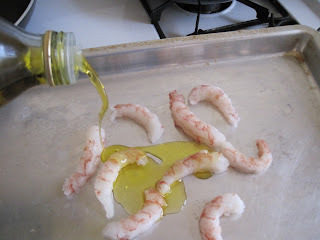 Get some shrimp, olive oil, salt and pepper. Got all that? I thought so. Mix it all up, roast it in the oven at 425 degrees for about 10minutes, and ENJOY. Ina uses jumbo shrimp in her recipe, but mine are on the small side, so I didn't cook mine quite as long...I think mine took about 7 minutes? When you can smell the roasted shrimp, they're done. I also didn't use as many--this was just enough for me. 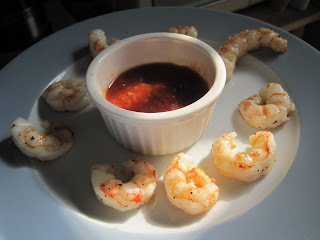 It's so easy and makes an incredible difference in the taste of the shrimp. These were gone before I even made my way to the living room. Trust me...you must try this one...if not for your next party, for your next Friday night! 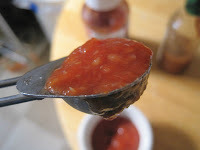 I am not a big fan of cocktail sauce (I think it's too ketchup-y), but I bet your tips would make it more to my liking. I'll have to try this one sometime. We've still got fresh gulf shrimp on every corner around here. They're delish!